One of my favorite soups to eat, especially in summer, is Gazpacho. It’s so refreshing on a hot, humid summer day. And even better, no oven is necessary so the kitchen doesn’t heat up. I like to make a big batch to have on hand in the refrigerator which we will eat for several days. We never seem to get tired of it. Gazpacho is such an easy soup to make. Just chop some veggies and throw it all in a big bowl with some seasonings and that’s it. 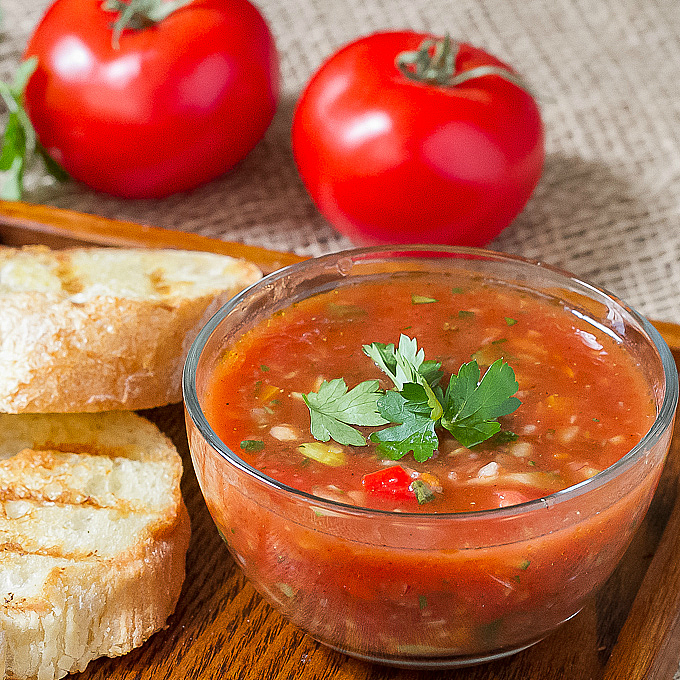 Authentic Gazpacho doesn’t use tomato juice, just lots of fresh, vine ripened, juicy tomatoes and bread to thicken it. It’s also pureed. There are a lot of variations for Gazpacho and I don’t think I’ve ever met a bowl of Gazpacho I didn’t like! When I make Gazpacho at home I use tomato juice, probably because I don’t always have the most flavorful tomatoes available (I wish I had a garden!). I do, however, always eat Gazpacho with some good crusty bread. You can top the soup off with whatever you like. Try some crab or shrimp. Or diced avocado. If you want a chunky soup, just dice up the veggies by hand to your desired size. You can also use a food processor. I like to use my food processor. I pulse each vegetable separately which seems to give me the texture I prefer. If you like a soup that’s puréed you can certainly puree the soup as well. I’ve made it that way too! When I do puree it, I usually add a couple day old slices of a baguette to thicken it like authentic Gazpacho. I’ve never used an immersion blender to puree the soup so I can’t tell you how well that works, I just puree the soup in smaller batches in a blender or food processor (you probably won’t be able to fit it all in at once). I like to let the soup sit in the refrigerator for a few hours for all the flavors to meld, then taste and adjust seasonings as desired. If you can’t wait that long, go ahead and serve yourself up a bowl, no one will know! A simple, chilled soup for summer. Roughly chop the cucumber, celery, red bell pepper, and onion. You can do this by hand or food processor. If using a food processor, chop one vegetable at a time. Put vegetables in large bowl. Add remaining ingredients and set in refrigerator to chill and let the flavors combine. Taste soup and adjust seasonings to taste.